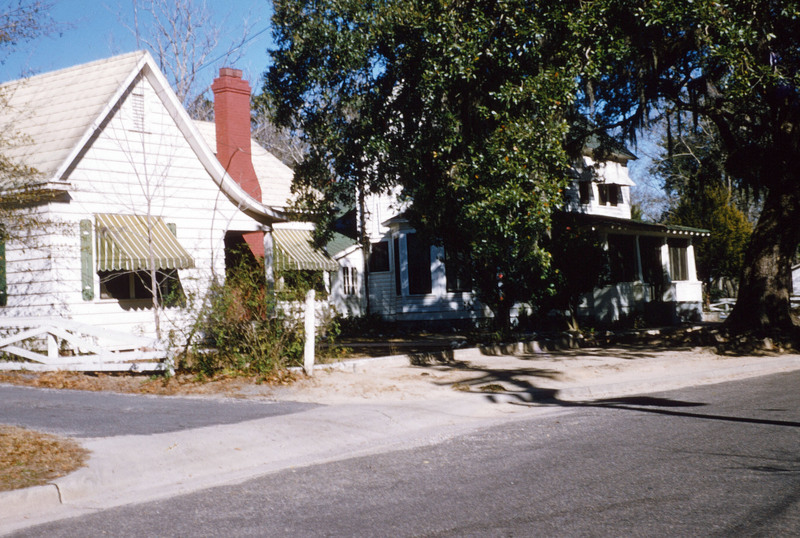 Here are some old photos of Fernandina Beach, Florida, where my brother and I were born, and where we lived during the summers as kids. Our family’s farm is on the mainland, in Callahan, which is about 25 miles away. My grandmother lived there and there were always a few uncles, aunts and cousins around. 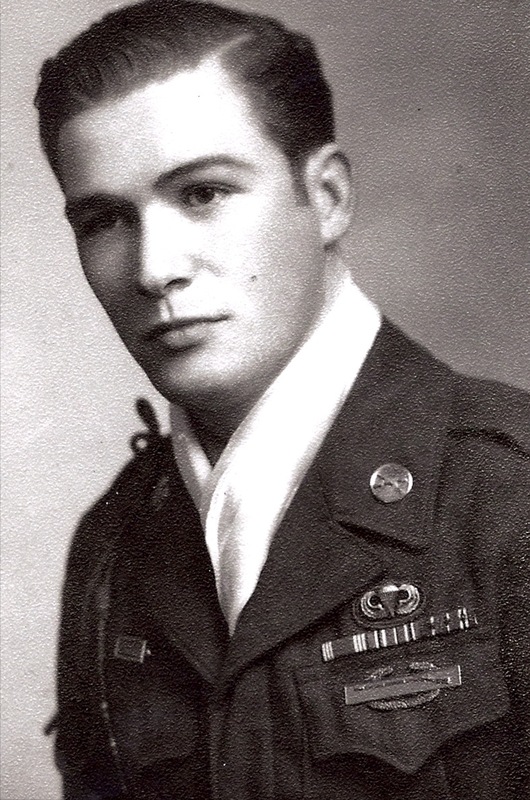 These photos are from about 1958. 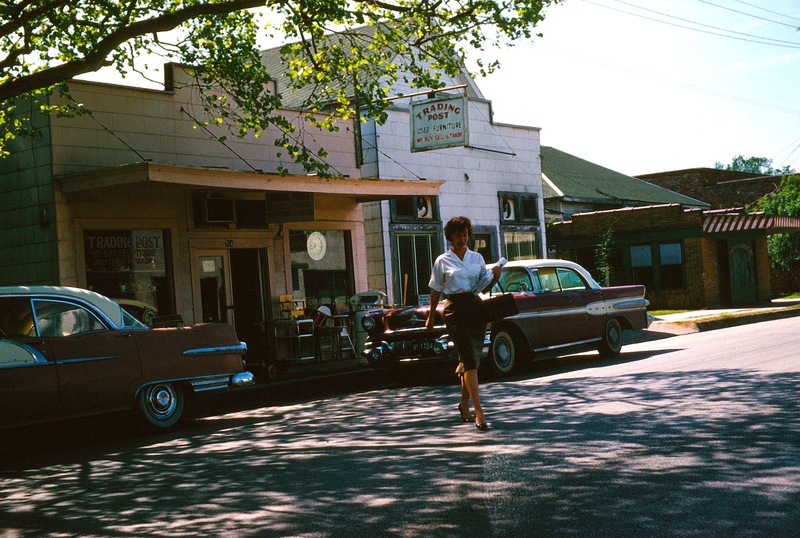 First we have a random street scene from the late 1950s. Most of these homes are now gleaming jewels, but in those days many Florida beach towns were more hardscrabble, rather down-at-the-heels compared to what they are now. Here are some fishing boats at the Fernandina docks. 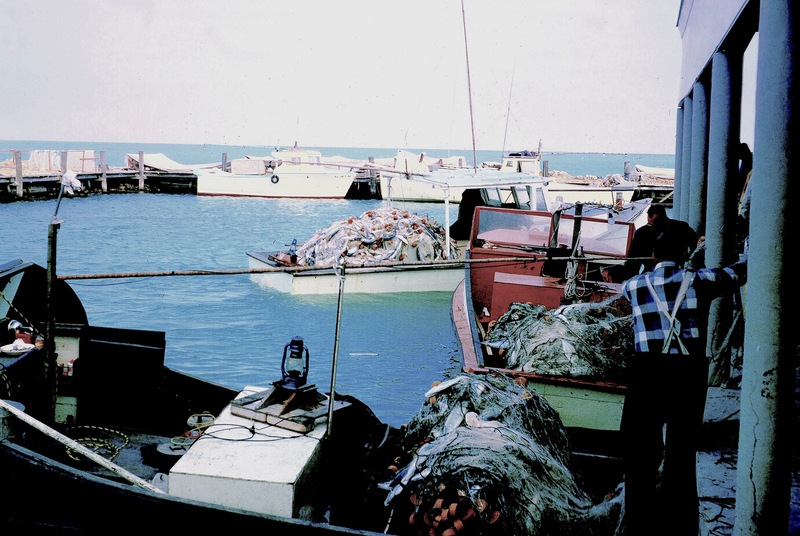 These are probably shrimp boats, because about the only time my mom would take us to the docks was when she was buying shrimp. Speaking of my mom, here she is walking to the car from the old Post Office, which isn’t shown in this photo. I’d love to have one of those old cars in the background! 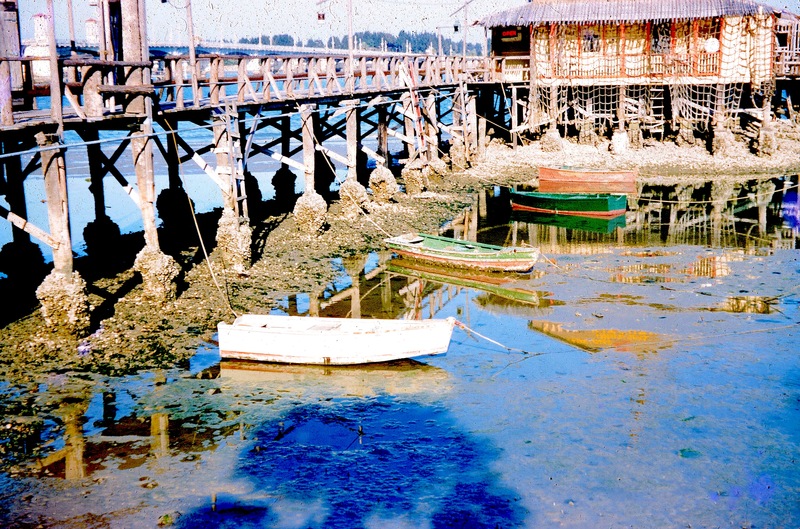 Another dock scene. I don’t know what that building is at the end of the dock, but the electric sign says it’s open for business. Probably a seafood shack. 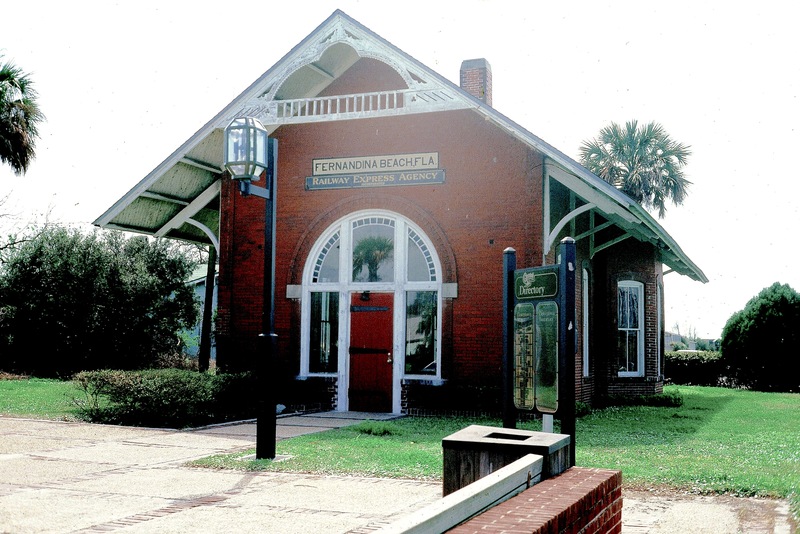 Last photo: Here’s the old Fernandina train depot, which I believe is now a visitor’s center. This photo isn’t as old as the others; probably from 1977 or so. By the time this was taken, the city fathers were snazzing up the place; especially the downtown area. They renamed the main drag Centre Street and the shops began trading to the increasingly large number of tourists. Fernandina was a cool place to grow up, as it had an old pre-Civil War fort, Fort Clinch, on the north end of the island. It was closed to the public in those years, but my great-uncle was the curator and administrator for it and he’d let us in to play and explore as long as we were careful. Outside the walls of the fort was the best place to crab using chicken necks on a string. At night it was spooky sitting there waiting for the crabs to bite; the abandoned fort’s walls looming behind us creeped us out. 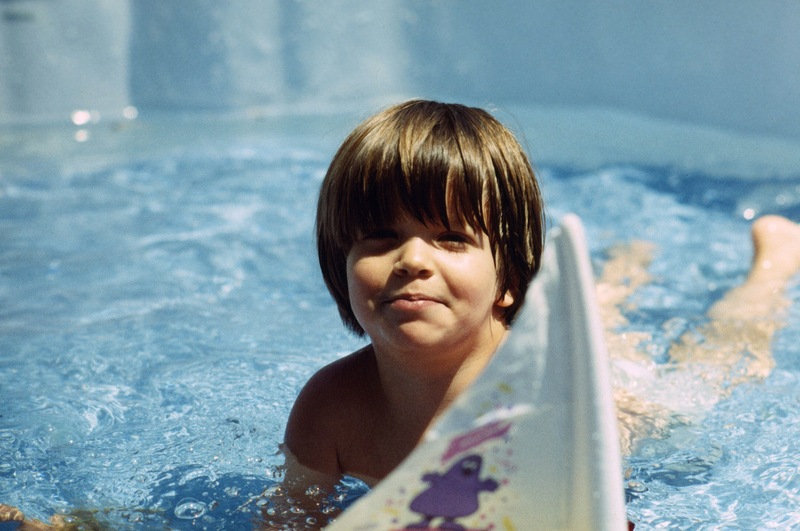 Kid Days . . .
Back to the old photos for a visit to the past. 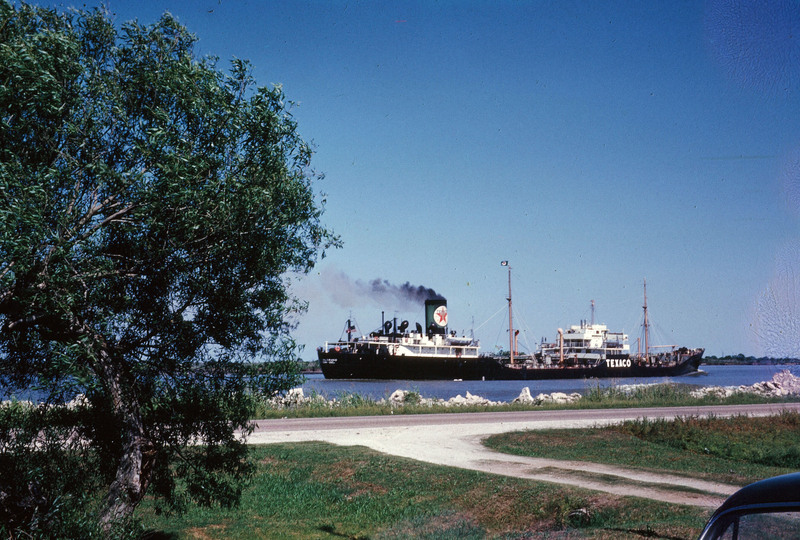 These were taken in Pascagoula, Mississippi in the late 1950s and seem so carefree. 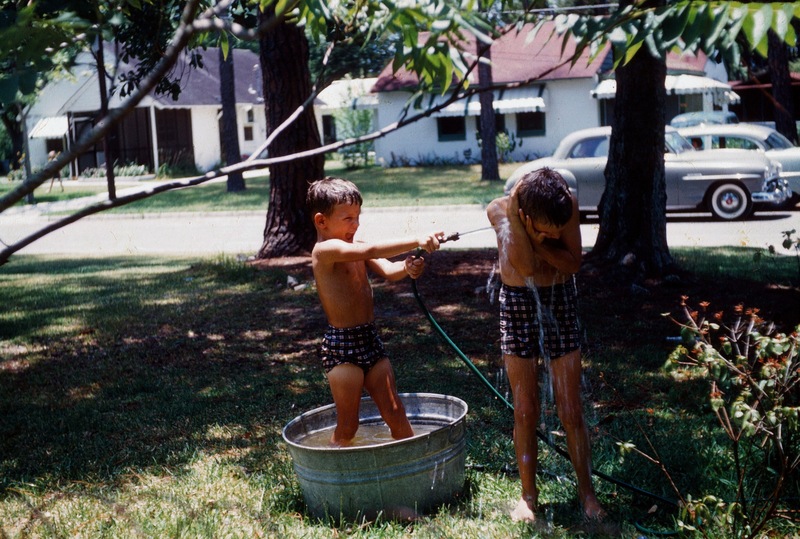 In this photo, my younger brother, Jeff, attacks me with a water hose, the bounder! He’s standing in a foot tub and seems to be enjoying himself! Jeffrey appears to be chewing on a blue-plastic shovel. He was three years old in this photo, but, oddly enough, I believe he still chews on blue-plastic shovels. In my opinion, the Paladin gunbelt was far more elegant than the Gene Autry, Lone Ranger or Roy Rogers gunbelts. It was black leather with a silver chess-knight emblem and was edged with silver beads. The guns were silver, too, with black-plastic grips. There weren’t too many bandits who hung around our house on Resca De La Palma Street, and that gun belt was one of the main reasons. Big Camera and a Whirler! Here’s the business end of the largest camera I ever used on a regular basis. It was a two-room Robertson copy camera. The camera back and digital controls were in a small lightproof room behind this one. The camera could take 48″ x 48″ sheets of film on its vacuum film plate. 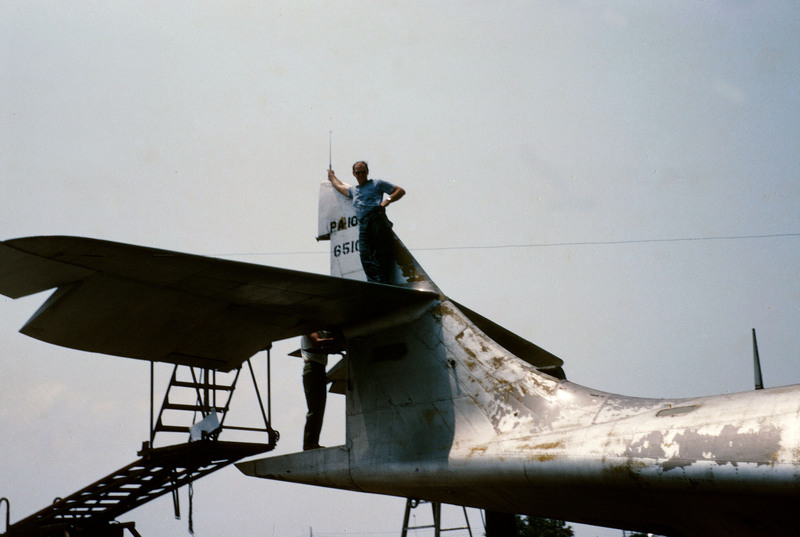 The front end of the camera, seen here, had a 10-foot bellows that extended on the overhead beams and the vertical image/copy holder (not shown because I was standing right in front of it) could hold a paper or film sheet between glass, vacuumed flat, up to 15 feet wide by six feet high. The halogen lights shown illuminated the copy. 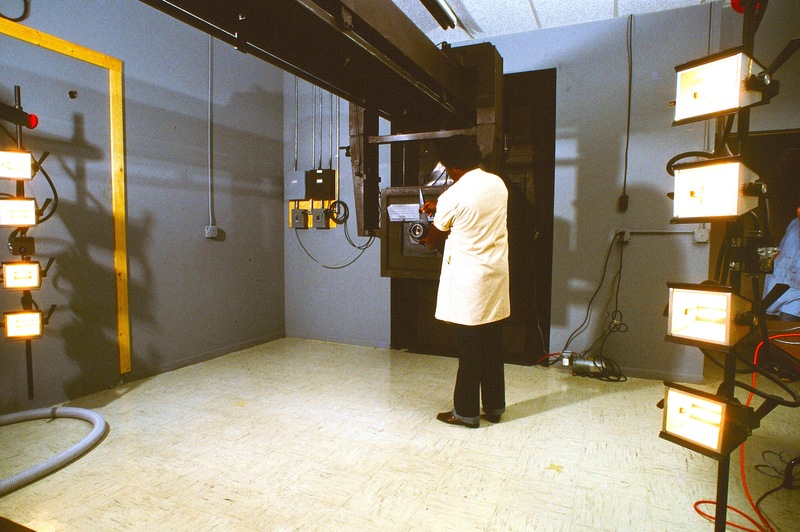 This camera was at Martel Labs in St. Pete, Florida, where I ran the 26-person photo lab for a few years. The camera operator is shown changing lenses. If you needed to shoot onto a piece of film larger than 48″ x 48″, you could reverse the lens to turn the camera into “blowback” mode, but I personally never used the thing that way. This was a super-expensive piece of gear; we used it for copying engineering or cartographic imagery. 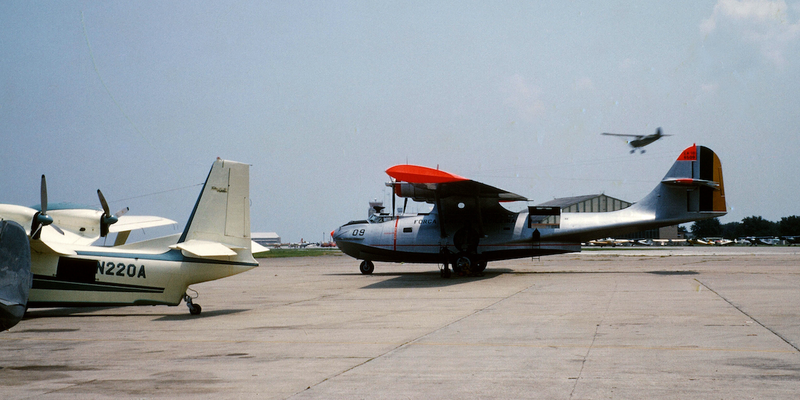 Our sister company, Chicago Aerial Survey, had a larger camera, believe it or not. Made by the Brown Camera company, it was vertical and two or three stories high. At the time I worked for Martel, my understanding was that the vertical camera at CAS was the largest camera in the world. Here’s another piece of gear most folks have never seen: a vertical emulsion whirler. Because of the weird photographic stuff we did at Martel, much of which was classified, we often had to make our own film. You can’t imagine the exotic chemistry we cooked up in this room. The film emulsions were so sensitive that we couldn’t use red lights, as in most darkrooms; we had to use dim green lights to work in. Anyway, this vertical whirler wasn’t completely vertical, but it replaced a horizontal one we had been using earlier. 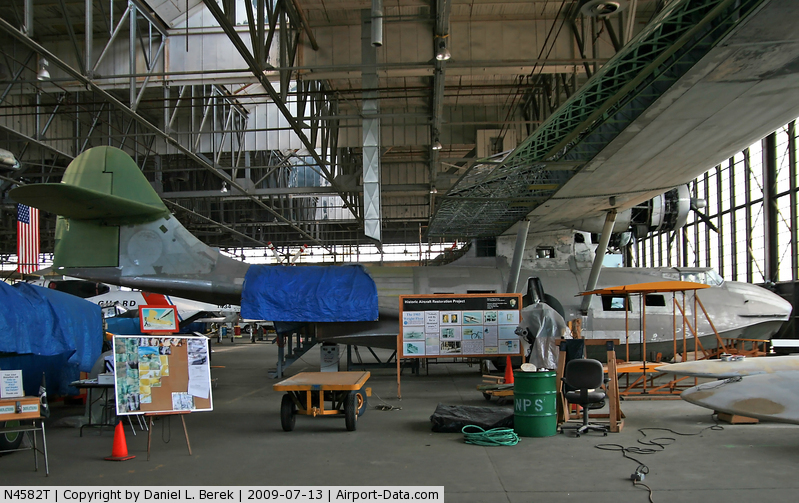 The sheet film shown is probably 80″ x 64″ and hasn’t been vacuumed totally flat yet; that took about 15 minutes to do. 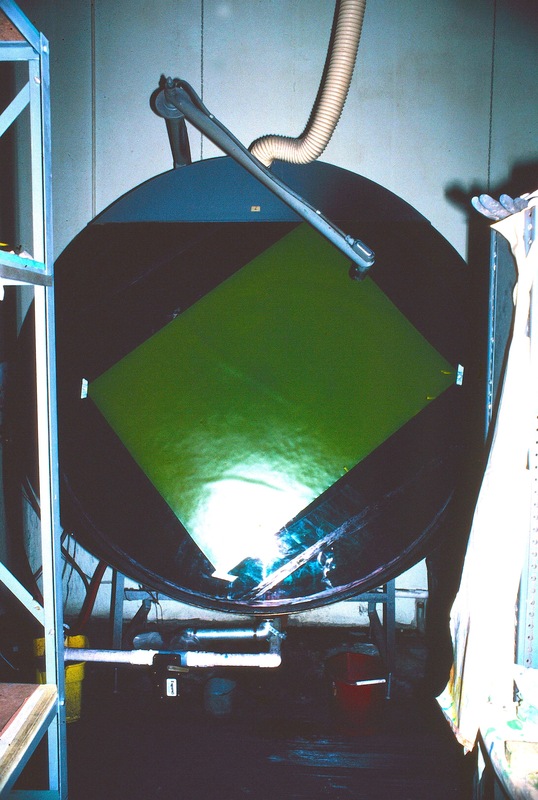 Once the plastic sheet was absolutely flat, the operator could flow the custom emulsion onto the rotating sheet and the slow rotation of the film bed would flatten the emulsion on the substrate. The tubular arm shown would blow a gentle flow of heated air onto the gummy emulsion, baking it onto the sheet and, after 45 minutes or so, you’d have a piece of film ready for whatever you needed it for. Usually it was used in a giant contact frame for duping large images from negs or positive film. Actually, it was 25 years ago, but what the heck! Here are some photos of the family when we lived on North Manhattan Avenue in Tampa. 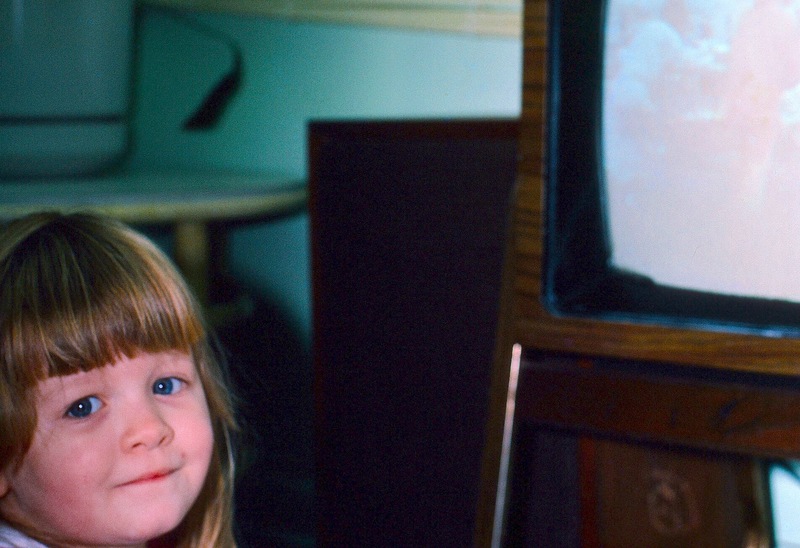 Colleen is shown here watching one of her then-favorite shows, Miami Vice. Not quite sure what a three-year-old got from watching that, but I expect she loved the music and the action of it. I love Neenie’s expression here; the photo itself isn’t all that great. 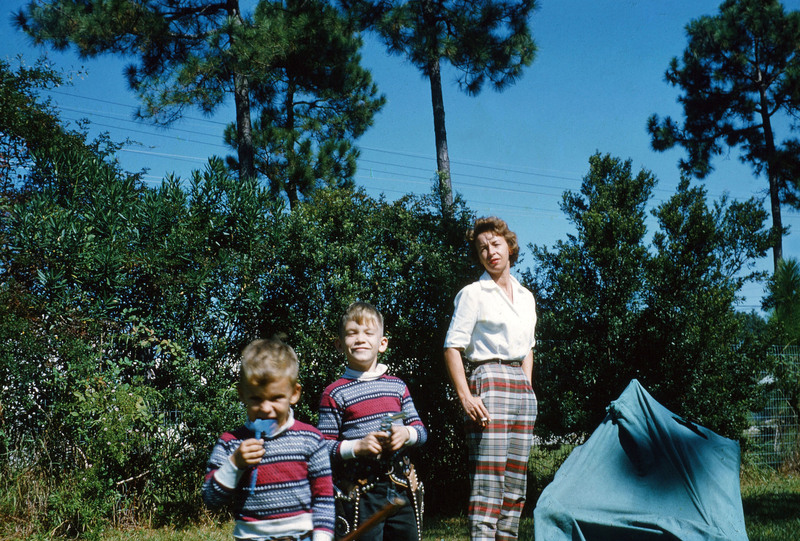 It wasn’t Mama that took our Kodachrome away, but the digital-camera revolution. The camera used here was my Nikon Nikkormat FT3, which, in my experience, had the best internal light meter of any SLR I ever used. Nothing else ever came even close. 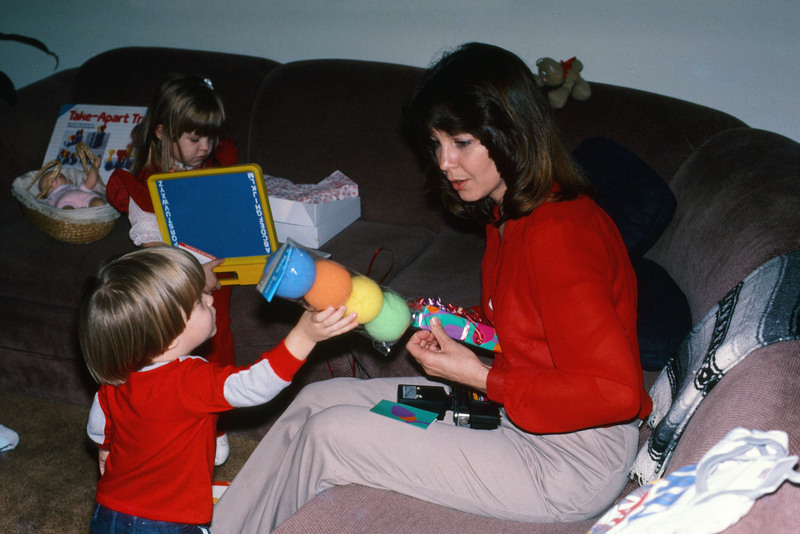 We wind up with a Christmas-time photo taken at Patty’s brother Billy’s house in Brandon, Florida in 1986. When I posted this photo on Facebook without specifying the location where it was taken, my sister-in-law Sheila immediately commented, “Hey; that was our couch!” Yes; Sheila; it certainly was. Shown are Neenie, Aaron and Patty. My dad rented a big house in the summer of 1959 on Highway 82 in Sabine Pass, Texas, right on the Intracoastal Waterway where it met the Sabine River. 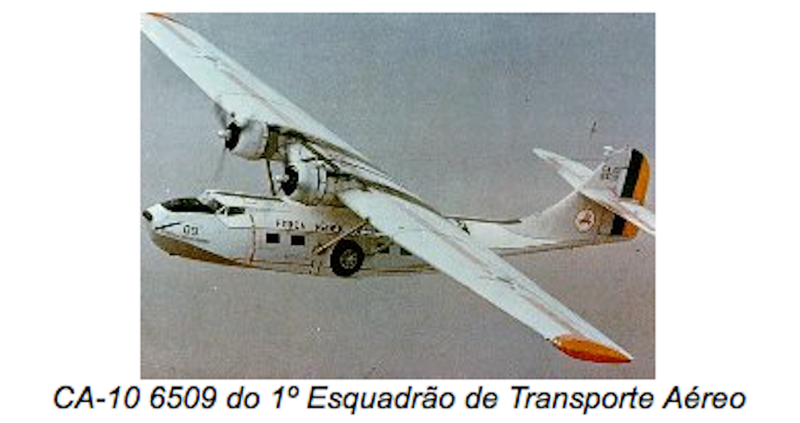 This remote place must have been close to an airport my dad liked flying out of; there wasn’t another house for miles. As the photo shows, huge tankers and other ships would pass within 100 feet or so of our front yard, all day and night long. Sometimes they be lined up like cars on a highway. Those boats were enormous; the one in this photo is typical; it’s the Texaco tanker Caltex Glasgow, and it was 524 feet long, according to a Net history of Texaco tankers. 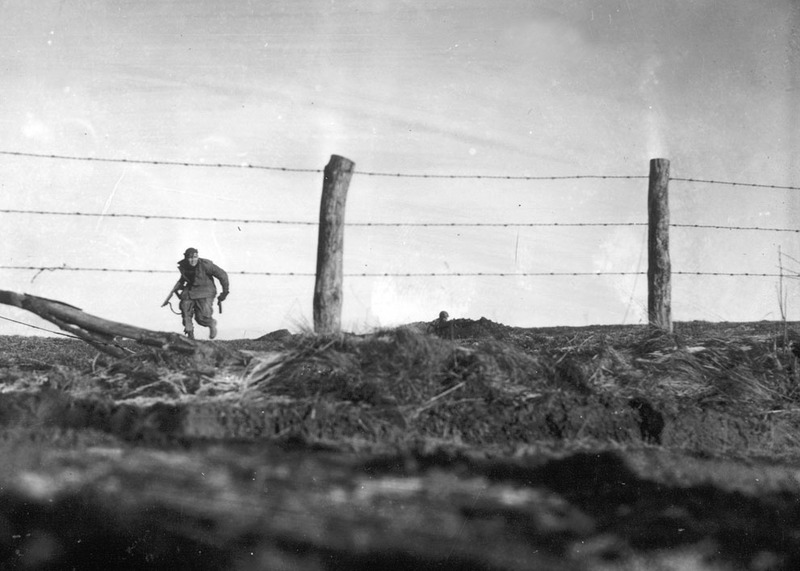 Being stuck out in the middle of nowhere was boring for a seven-year-old kid. My only companion besides my brother was an ancient black man named Jim, who lived rent-free on the property in a ramshackle frame house. Jim wore a big white cowboy hat and made a living catching and penning alligator gars in the river and bayous and selling them to folks. Gars are ferocious fish, as much as seven feet long and well over 150 pounds each, as I learned watching Jim feed them horsemeat scraps every evening. I followed Jim everywhere, as he was quite a storyteller, though some of his history was a tad off. He told me his daddy had been a slave freed by President Teddy Lincome, and that President Garfield had been shot by a maniac named Charley Guitar (close; it was Charles Guiteau). Other than pestering Jim, there was little to do, but my mom didn’t like me getting close to that pen full of alligator gars. 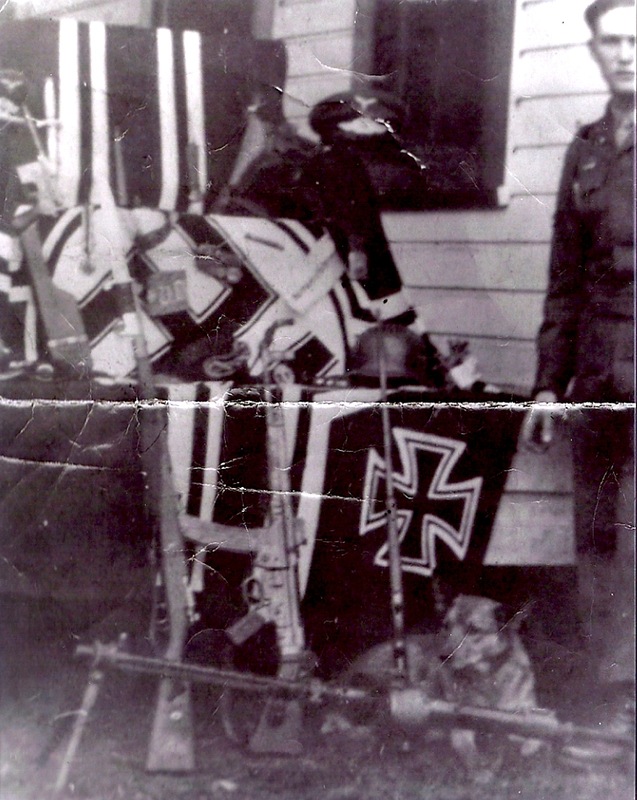 My dad solved this problem by buying me, at a ship chandlery, a big cardboard box of about twenty three-foot by five-foot flags of various countries and a little flagpole. When a foreign ship went by our front yard, I’d put their flag on the pole and wave it with all my might. My mom wouldn’t let me walk across the highway to the Waterway, but usually someone on the ship would see me waving their country’s flag and I’d be rewarded with a mighty blast from the ship’s horn. Sometimes the fellows on the ship would yell and wave to me. It took about ten minutes for each ship to go by, and I’d see many ships a day. It became a pretty nice summer, after all.